GE Lighting UltraMax™ High-efficiency linear fluorescent ballast is suitable to use with three F32T8 and U lamps. It has voltage rating of 120 - 277-Volts and current rating of 0.96-Amp. Instant start ballast with 1.18 ballast factor, offers greater than or equal to 99% power factor. It features type 1 outdoor enclosure. It has parallel lamp connection. Ballast operates at the frequency rating of 50/60-Hz. It provides Class P protection. Ballast measures 9.5-Inch x 1.3-Inch x 1-Inch. 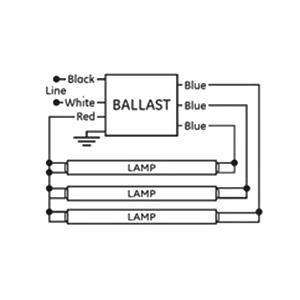 Anti-striation control of this ballast ensures better light quality. It withstands temperature rating of 90 deg C. Ballast is UL/cUL listed, RoHS compliant and meets FCC standards.